Gourmet road-trippers, have I got a winery restaurant recommendation for you. 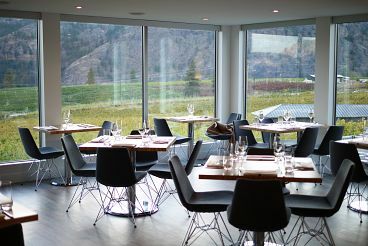 Recently, during a Naramata wine tour, my travel partner and I discovered Liquidity Winery Bistro and as we pulled up, our jaws literally dropped. Besides the grand entrance, a perfect wooden sphere made with fallen Stanley Park trees greeted us. And the view was something else altogether. As for the food, Chef Rob Walker’s menu did not disappoint. The Ocean Wise Cioppino served with crusty bread and dungeness crab aioli was a massive home run, as were the warmed olives with spiced nuts and toasted buckwheat. If you were to choose one wine, go with Liquidity’s Pinot Noir, their most popular bottle. Liquidity Winery Bistro’s Fall and Winter hours are limited, but up until December 13th, they’re open for dinner from Thursday to Sunday.